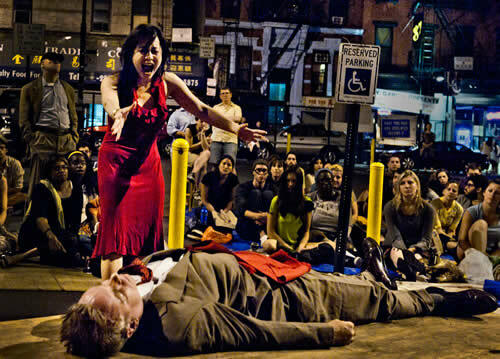 This weekend is your last chance to catch The Drilling Company’s free production of Hamlet, the final show of the 20th season of Shakespeare in the Park(ing) Lot, a summer New York institution performed in a municipal parking lot at the corner of Ludlow and Broome Streets in Manhattan’s Lower East Side. Shakespeare in the Parking Lot typically presents bare-boned adaptations of the classics set in contemporary times. For example, last summer, “Julius Caesar” was staged as a battle for control of an urban school system, with women playing Brutus and Cassius. 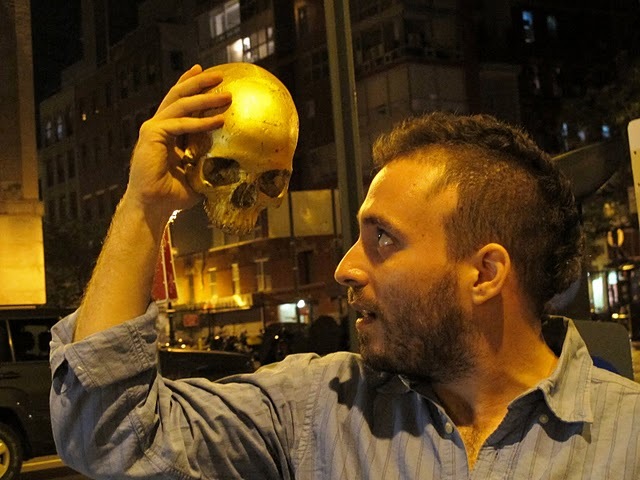 “Hamlet” departs from The Drilling Company’s normally political edge. In an unusual interpretation, the production is intended to illuminate the modern dysfunctional family unit. However, cuts have been made and scenes reordered to streamline the storytelling and to reduce the running time to two and a half hours. Unlike Central Park’s Delacorte Theater, where it’s easy to forget you’re in the city, here it’s impossible. And that’s part of the fun. Cars come and go during the show. The other night, one particularly rude driver pulled out right in the middle of Hamlet’s “To be or not to be” soliloquy. 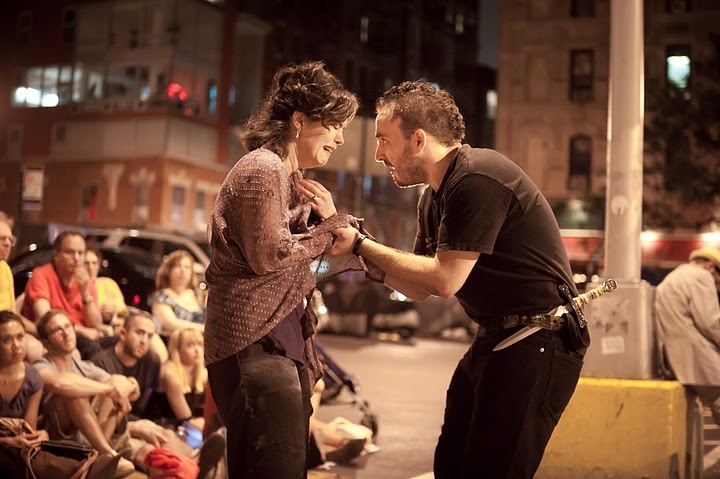 The Drilling Company presents “Hamlet,” the closing show of the 20th season of Shakespeare in the Park(ing) Lot, July 28 to August 13 in the Municipal Parking Lot at the corner of Ludlow and Broome Streets, Manhattan. The location is one block south of the F train station at Delancey Street. All performances are free. Shows are Thursdays through Saturdays at 8:00 PM. For more information visit www.shakespeareintheparkinglot.com.